Evanston (population: 74,239) is located in the far northeastern part of Illinois. The town is directly north of Chicago, bordering the Windy City's northeastern most area. Evanston is situated in the near-northeastern portion of Cook County and is part of the affluent region along the North Shore of Lake Michigan. The Chicago & Northwestern Railroad passes through town as do several well-known local roadways including Green Bay Road, Sheridan Road, and Dempster Street. The community's beginnings trace back to the 1830's as part of the Grosse Pointe territory, later to be renamed Ridgeville in the 1850's. Evanston did not incorporate until 1863 when it was named after the founder of Northwestern University, John Evans. A number of fraternities and sororities have their national headquarters in Evanston, as does the Women's Christian Temperance Union (WCTU). The mentioning of Northwestern University brings us to the history of the former preparatory high school known as Evanston Academy. 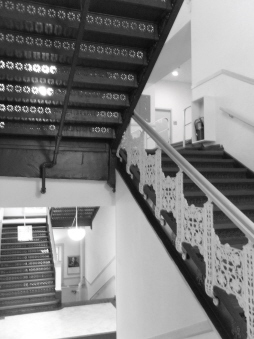 A thorough history of this school can be viewed by clicking on this link: Evanston Academy History . The Preparatory Department of Northwestern University opened the Preparatory School in 1859. There was felt a need by the university's faculty to provide advanced academics to those who wished to attend Northwestern so that these students would be prepared to attend college. The first boys were admitted in 1859 with the female students being admitted one decade later. Originally the school allowed for a three-year pre-prep school for ten year olds and up with a four-year prep school that followed. This system was eventually cut to a four-year prep school however. The prep school was lodged in the former College building of Northwestern University. It was renamed the "Academy" in 1892 and was moved to a larger facility in 1899. The Academy prospered for many years, especially under the leadership of Herbert Franklin Fisk, who was the school's director from 1873 through 1904. The institute was known as Northwestern Academy until 1905 when the name was offically changed to Evanston Academy. The expansion and availability of area public high schools and the start of World War I would ultimately cause the Academy to be closed. This decision was made final at the end of the 1916-17 school year. A photo of the older school building (Old College) would be a welcome addition.to this page. 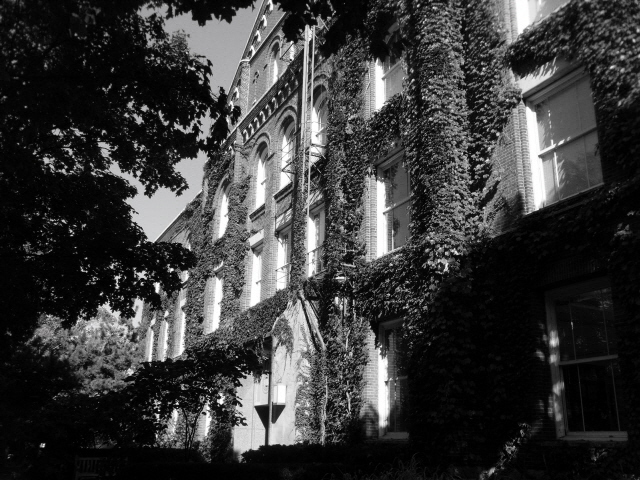 Pictured above is thew "newer" school building, today known as Fisk Hall and home to Northwestern University's Communications Department. We know that the boys of Evanston Academy played football, basketball, golf, track, and baseball. Their great success in these sports will be listed below. We believe that other sports were a part of the Evanston Academy athletic program. School team nickname, uniform colors, fight song, season records, coach's names, and individual accomplishments are all items we are seeking. According to historian Robert Pruter, the school was a member of the North Shore League during the early part of the 1900's, and also competed as a member of the Academic & Western Academic Leagues before the school closed in 1917. We only have insight to three seasons in Evanston Academy's hardwood court history. But one of them was for the ages! The boys of 1913-14 earned a FOURTH PLACE FINISH in the IHSA State Basketball Tournament that year. They earned a District Title and competed in the IHSA's quarter-final round, beating Galesburg 49-23. They followed that up with a final four loss to Hillsboro (37-31) and a consolation loss to Normal University (31-23). Hillsboro would go on to win the IHSA State Championship that year! The school also claimed the 1907-08 North Shore League regular season championship, as well as the league tournament that year, and followed up the feat by taking the league tournament in 1908-09. Any further information about this team or any others in Evanston Academy history is welcome. 1913-14 IHSA TOURNAMENT - FOURTH PLACE!! The thinclads of Evanston Academy hold the distinction of having the ONLY IHSA State Meet Championship in Class 'C' in Illinois history (http://www.ihsa.org/activity/trb/records/team1-2.htm). Class 'C' was added for the 1915-16 season to accomodate the private schools of Illinois and even some from surrounding states. The boys of 1915-16 cleaned house, winning the Class 'C' Championship by a score of 48-25 over its nearest competitor, Lake Forest Acadeny. Several individual athletes led the way for Evanston Academy. This great season is chronicled below, as seen on the IHSA web address of http://www.ihsa.org/activity/trb/records/ybysch5.htm. In addition, the school also won three indoor conference titles as a member of the North Shore League, and two outdoor titles in the Academic League. 1915-16C IHSA STATE 'C' MEET CHAMPIONS!! RELAY TEAM 880 Yard Relay STATE CHAMPIONS!! H. Armstrong High Jump STATE CHAMPION!! E. Burgess 1 Mile Run STATE CHAMPION!! Ken Cram 220 Yard Dash STATE CHAMPION!! F. Hamm 440 Yard Dash STATE CHAMPION!! Mueller 880 Yard Run STATE CHAMPION!! We are certain if the sport of golf was offered at the school, and one of the great amatuer golfers in the United States of the early 1900's came from Evanston Academy. According to the IHSA website address of http://www.ihsa.org/initiatives/hstoric/golf_boys_early.htm, the infamous Charles "Chick" Evans Jr. was a graduate of Evanston Academy who would go on to win several amateur tournament championships in the 19-teens. He would also lead Evanston Academy to a local high school golf league championship in 1908. Evanston Academy scored a number of successes on the gridiron with five conference titles. During that span, the school dropped the sport for a time at the request of Northwestern University in 1907 due to the brutal nature of the game at the time. Evanston Academy had more than one successful sport in the springtime, taking home nine conference titles between 1898-1916 on the diamonds of the Academic & Western Academic Leagues. The boys at Evanston Academy also enjoyed getting on the tennis courts during the spring against other area schools, coming home with one conference title in 1902. --Louis N. James—a recent graduate when the institution was known as Northwestern Academy, 19-year old James at the USGA national amateur golf tournament in Chicago in 1902 astonished the field by winning it all. --Robert Foster (class of 1908)—just following graduation from Evanston Academy, Foster was selected for the 1908 Olympic swimming team, but did not place in the three events he entered. --Charles “Chick” Evans (class of 1909) – at Evanston Academy was a leader in Illinois high school golf, winning the Western Interscholastic in 1907 and 1908. He eventually entered the golf hall of fame, for his achievements in winning the USGA amateur in 1916 and 1920, and the USGA open in 1916. --Frank Loomis—began his high school career at Evanston Academy but in the fall of 1915 joined Sherman Landers in moving to Oregon High. At Oregon, the two became the greatest two-man high school track team in history, winning in 1916 interscholastic meets at Northwestern, Minnesota, Kansas, and University of Chicago. In the 1920 Olympic Games, Loomis took first in the 400-meter hurdles. We are certain that Evanston Academy had some very tough academic standards. There were probably several activities offered to the students, besides sports, that made their educational experience a well-rounded one. Please contact us to add them to this page. Do You Have Information to Share on This Page?